The D-wave of corticospinal tract (CST) motor evoked potentials (MEP) recorded from the epidural space of the human spinal cord reflects synchronous impulses mediated by CST axons activated directly, without any intervening synapses. The location of the motor cortex can be identified during intracranial procedures by recording corticospinal MEP. The functioning motor cortex is sometimes displaced in patients with brain tumors or arteriovenous malformations. Corticospinal MEP are specific indicators of CST function. 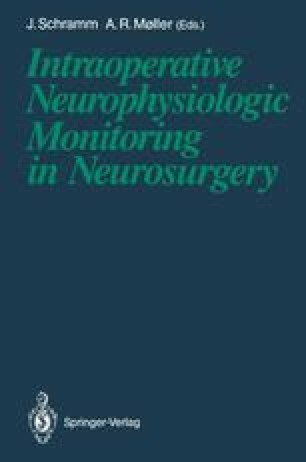 Therefore, intraoperative monitoring of corticospinal MEP provides useful information about possible damage to CST axons from manipulations during intracranial and spinal operations. This technique has been used in more than 300 cases to date, and no complications have yet been noted.